The Duchesse. French nobility fashion 14th century. Home » The Duchesse. 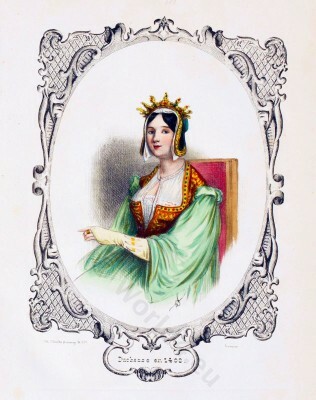 French nobility fashion 14th century. The woman wears a tight-fitting bodice that laced at the front. Among a long-sleeved dress with deep lower neckline whose sleeves cover the hands. Furthermore the pleated Chiopa with wide cap sleeves. The high hairline is highlighted by a richly decorated horns cap. Fashion in the Reigns of John and of Charles V. 1350 to 1380. Fashion in the Reigns of Charles VI. and Charles VII. 1380 to 1461. The Romance of the Rose. This entry was posted in 14th Century, 15th Century, Burgundian dress, France, Headdresses, Middle Ages, Nobility and tagged Burgundian fashion period, Gothic costumes, Hennin, Medieval costume, Paul Gavarni on 3/27/13 by world4.